Facts about Squids. If you only know the basics then it is time to find out more about these fascinating creatures. Habitat, Anatomy, Feeding, Predators, Reproduction, Evolution and more interesting information about Squids. There are more than 300 known species of squid out there that have been identified. They fall into one of two categories – myopsida and oegopsida. Due to the overwhelming demand for calamari by humans, commercial fishing for them is a big business. There are plenty of restaurants out there that serve this type of dish. Facts about Squids, Giant Squid, Colossal Squid, Humboldt Squid, Vampire Squid. There are more than 300 different types of squid that have been identified around the world. However, it is believed that many more exist out there. We simply haven’t been able to find them all and to identify them all yet. Those that we do know about have evolved along with other mollusks. They only live in the water but can be found in a variety of locations where the temperatures are from one range to the next. Their bodies are very soft which is why they tend to make a nice meal for so many predators. Some of the larger squid can weigh more than 1,000 pounds. The ink sac can be triggered to release this black substance very rapidly. 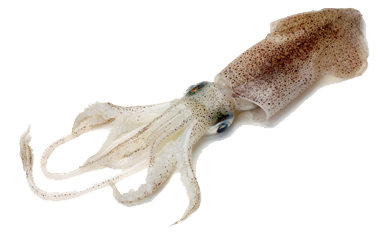 The overall size of a squid can vary depending on the species. Some of them are only 24 inches long while others are more than 40 feet in length. The heaviest squid found was in 2007 around New Zealand. It was more than 1,000 pounds! They body of a squid may seem very unique, but it definitely serves its purpose in the water. As a squid moves through the water, they stretch in the mantel area. This is going to force water to be moved through the funnel. You will notice that they move tail first through the water. They are very quick as well as agile in the water. When a squid feels that they are in danger they release a dark color of ink as they try to make their rapid escape. The overall look and design of a squid will depend on the species that it belongs to. There are more than 300 of them that have been scientifically identified. Depending on their size, they can consume a variety of meat items in the water. Some species are much more aggressive than others so they go after larger prey. It can be fun as well as educational to look at photos of the different types of squid. You will be able to see first hand the differences in their appearance as well as their size. Many people don’t realize that what they may see in the water is a squid though because one species can look so different from others they have previously identified. It is believed that the squid is one of the invertebrates that has the highest level of intelligence. They are extremely active and they seem to do quite well when it comes to adapting to the changing environment around them. Some people wonder why they are considered to be mollusks. It is due to the horny plate they have that is buried under the mantle. A squid has gills which is uses to breath through. Therefore it doesn’t have to go to the surface of the water for air. They have a very complex body design for a mollusk which makes them very fascinating. They are also simple enough to capture in the water. This is why so many fishermen use squid for bait. It is an attractive way for them to get a variety of fish. There is plenty of research that still needs to take place before we completely under the squid. We do know that they are a huge part of the survival of aquatic life as many types of creatures feed on them. There has been more information discovered in the past decade due to new techniques and technology. A great deal of such technology has helped to get rid of the negative stereotype that squid have in some cultures. There are many old stories that depict them as monsters living in the water. This is believed to have come about due to the strange body appearance as well as the huge size of some of the giant squid out there. These are creatures that serve many purposes in the various bodies of water out there. Without them, the food source for many others would be significantly reduced.